Data migration can be accomplished using either pass-through mode or virtual disk pools. Inevitably storage equipment ages or fails, and it must be replaced. SANsymphony simplifies the process of migrating data to new equipment without many of the difficulties, delays and stresses usually associated with these moves. Often the transition can take place during normal working hours without disrupting applications. The product has also been designed to facilitate the maintenance and upgrade of the servers where the DataCore software runs, while applications continue to run uninterrupted. SANsymphony provides facilities to migrate data currently contained within virtual disk pools to newer storage devices. SANsymphony will also migrate data from storage devices that were not originally managed by SANsymphony. 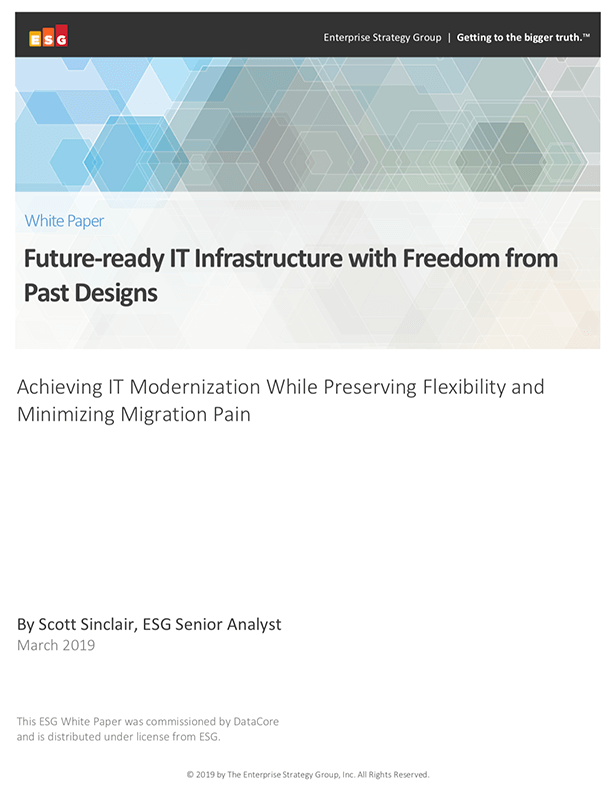 In either case, the migration is greatly simplified and can be accomplished, in both scenarios, with no downtime. The first method of data migration uses pass-through mode. This mode makes no modifications to the underlying storage device. The original volumes are passed through the SANsymphony node to the application servers. No other fabric or network changes are required. The application servers see the original volumes as they existed and continue processing normally. Now that SANsymphony resides in the data path, features such as high-speed caching, synchronous mirroring, snapshot, and replication can be utilized. Ideally, the pass-through storage device would be migrated to a native SANsymphony virtual disk pool to leverage the full feature set. The second method of data migration leverages an existing virtual disk pool within SANsymphony. Add the new storage device to the virtual disk pool and remove the old storage device. SANsymphony will automatically and non-disruptively move all the data from the old device to the new device. Once the move is complete, physically detach the old device and the migration is done. When taking a SANsymphony node down for a prolonged period, control of that node’s shareable storage resources can be transferred to a standby node without disrupting applications. The standby node takes the place of the one undergoing maintenance to maintain two active mirrored copies of data for high availability. In addition, the standby node ensures that the overall throughput and responsiveness of the system remains intact. The same technique may be used to offload some of the responsibilities of an overtaxed node. For example, some of the virtual disks and corresponding storage devices from a node near its capacity/performance limits can be redistributed to a 3rd node; essentially increasing the power of the storage infrastructure by 50% or more. This should enhance the responsiveness of the overall system and set the stage to absorb additional workloads. Talk with a storage expert to learn how DataCore can help you seamlessly migrate data and upgrade storage resources without a breaking sweat.